The Survey of Household Spending (SHS) is conducted on an annual basis by Statistics Canada. It provides detailed information on household expenditures, as well as demographic characteristics of the household and certain information on household equipment (e.g., electronics and communications equipment). Methodology for the SHS has changed in 2010 and no comparison is possible with previous years. Moreover, performing arts expenditures are now aggregated with live sporting events. In spite of these limitations, the SHS remains a useful source of information about the use of disposable income. This brief report provides an overview of selected expenditures from the 2014 SHS as they relate to various forms of engagement with arts and culture. In particular, the report looks at entertainment expenditures and communication expenditures. Note: A brief analysis of the 2015 SHS was published on February 27, 2017. Entertainment outside of home bent 24%. Entertainment outside of home includes movie theatres, live sporting and performing arts events, and admissions to museums, zoos and other sites. There can be a lot of annual variation within some of these sub-categories, which is to be expected for items that represent less than 1% of household expenditures. In order to minimize variations due to margin of error, they are presented in the following chart as a stacked columns, which is also fitting considering that culturally active people are promiscuous and attend a variety of activities. Movie theatres saw the largest increase between 2010 and 2014, growing from $46 to $69 per household. They nonetheless experienced a decrease of 22% in 2014. Museums, zoos and other sites had nominal increases on all years, but had a sharp drop of 50% in 2014. Live events had a number of ups and downs. They went up 40% over the 2010-2014 period, but bent down 9% in 2014. All in all, expenses for entertainment outside of home follow a pattern of recovery from the economic downturn. Is the 2014 a significant decrease or just a return to normal after a peak year? Is disposable income being displaced to other kinds of recreation expenses? We'll have to suspend our assumptions until the 2015 figures are available. All we can say for now is that entertainment expenses aren't growing at the same pace as other types of expenses. In 2014, Canadian households spent considerably more on a number of "current consumption" expenses. For example, shelter expenses rose 5% and food, 14% (in comparison, the inflation rate for 2014 was 2%). Among current expenses, communications are experiencing several significant transformations: mobile services are taking over landline telephones expenses; Internet service keep rising and rising; and, once-marginal expenses categories have become noticeable elements within the communications shopping cart. In 2014 alone, expenses for online services have more than tripled, soaring from $14 to $48 per household. These include fees for on-line viewing of movies and TV episodes (for example Netflix), and music streaming services (for example Spotify). This dramatic increase illustrates the rapid and profound transformations in ways that Canadians access cultural content. The use of bandwidth or airwaves to carry large video and audio files induces in increases in both internet services (31% over four years) and mobile services (36% over four years). Purchases of phones are also seeing a significant surge, rising 61% over four years to reach $92 per household in 2014. 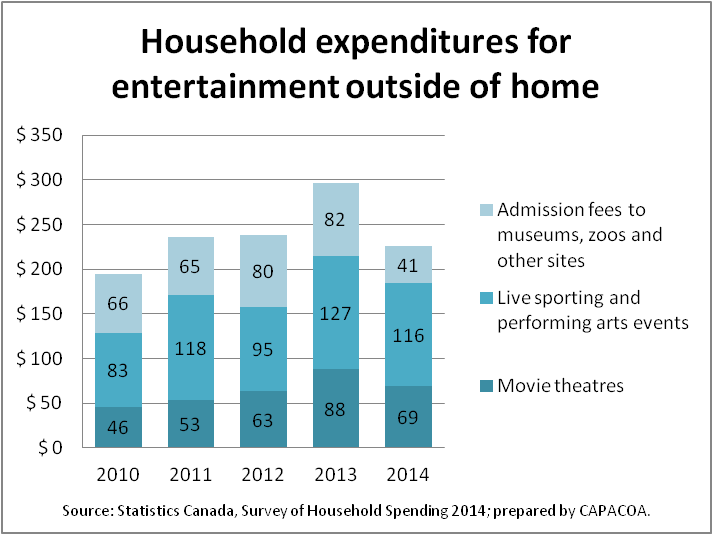 In comparison, Canadian households spent $116 for live events during the same year. All in all, these changes suggest that Canadians are willing to pay more and more for the physical devices on which they access cultural content, for the data packets that carry the content, as well as for the distribution of content via online service providers. These transformations however beg the question: should communication expenses still be considered current expenses for household operations (the category they currently belong to) or is time we start looking at them as recreation expenses?